This fact sheet is for women who have been diagnosed with breast cancer that has been found in the bones. Deposits of cancer in bones are called ‘bone metastases’ or ‘bone secondaries’. This information is a general guide. Because every woman’s cancer is different, the symptoms, treatment and prognosis varies from one person to another. You should speak to your doctor for detailed information about your specific situation. A bone metastasis from breast cancer is made up of breast cancer cells. Bone is one of the most common places for breast cancer to spread. What are the symptoms of bone metastases? If your breast cancer spreads to the bones, you may experience some of the symptoms described below. Symptoms may vary depending on the location and size of the cancerous deposit. Sometimes bone metastases don’t cause any symptoms at all and they are picked up on a routine scan. It is also possible for some metastases and not others to be bothersome. Symptoms may develop over weeks or months. It’s very important for you to tell your doctors and nurses about any new symptoms or any change in symptoms. Pain is the most common symptom of bone metastases. It tends be a constant, aching pain that may be worse during activity and can cause sleeping difficulties. Bone pain from cancer tends to be quite different from the pain caused by common conditions such as arthritis or muscular strains. However, in the early stages, it may be difficult for you and your doctor to tell the difference between these types of pain. Most of the time, aches and pains that women experience after they have had treatment for breast cancer are not related to bone secondaries. Cancer deposits can weaken a bone and this can cause the bone to break (fracture). When there is cancer in a bone, it can break without much force. This can happen after a fall or injury, but may also simply happen during everyday activities causing sudden, severe pain. Some fractures may be prevented or treated with surgery and/or radiotherapy. If you notice any of these symptoms you should seek medical attention immediately. Early treatment of this condition is essential to prevent long-term damage or paralysis. A magnetic resonance imaging (MRI) scan must be done quickly to see if the cancer in the bone of your spine is pressing on your spinal cord. If there is compression, urgent radiotherapy and sometimes surgery to ‘decompress’ the area is required. Cancer in the bone can increase the levels of calcium in the blood. This can sometimes cause symptoms such as thirst, passing urine more often, vomiting, constipation or confusion. However this is very rare and can usually be easily controlled. Talking to your doctor about any new symptoms is the first step. Your doctor will perform a physical examination and may recommend some tests. There are many tests that are used to find the location and size of bone metastases, including the following blood tests and imaging. Cancer in the bones can cause high levels of chemicals in the bloodstream, such as calcium and alkaline phosphate. Often a simple X-ray can show a bone metastasis, but your doctor may also order other types of scans. A bone scan is a nuclear medicine test. A radioactive fluid that is attracted to bone cells affected by cancer is injected into a vein. A scanner takes a series of pictures, and any areas of cancer in the bone show up as darker areas, sometimes called ‘hot spots’. This test has very low radioactivity and does not cause side effects. 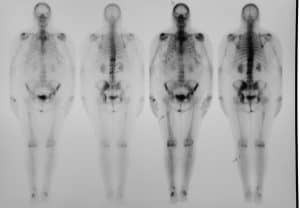 A nuclear medicine bone scan showing the body from different angles. This scan shows hotspots; some of these are due to cancer and some are due to arthritis. This imaging procedure gives more detailed pictures of your body by taking lots of pictures from different angles. It can be used to show more detail of a specific bone or area. This scan is not necessary for all women with suspected bone metastases. These scans use radio waves and strong magnets instead of X-rays to take detailed pictures of specific bones. This scan is not necessary for all women with suspected bone metastases. This is another nuclear scanning technique sometimes used to detect metastases by creating a 3-dimensional picture of your body, with the use of radio waves that show up after an injection. PET scans are not routinely used to look for bone metastases. If your doctor recommends that you have a PET scan you should speak to your doctor about possible costs as it is not usually covered by Medicare. How are bone metastases treated? Although it is not possible to cure bone metastases, they are not usually life-threatening. Many women enjoy active lives for many years after bone metastases are diagnosed. systemic cancer treatments (such as hormone-blocking therapy, HER2-blocking drugs and chemotherapy) which work on the whole body. Treatments are often very effective in stopping the growth or decreasing the size of cancerous deposits in the bones. Current treatments are not usually able to completely remove all cancer cells from the bones. hormone-blocking therapy, HER2-blocking drugs and chemotherapy) which work on the whole body. Effective pain relief is very important. Pain medication works best when it is started before the pain becomes severe. You should talk to your doctor early about any new or worsening pain symptoms you have. Pain relief includes drugs (medications) and non-drug treatments. There are many different types of drugs that are used to treat different types of pain. These may be taken as tablets, liquids, injections, patches or suppositories. Your doctor may recommend paracetamol or anti- inflammatory drugs (such as ibuprofen) which are helpful in treating mild-to-moderate bone pain. Stronger drugs, such as codeine and morphine, are very safe and effective for treating moderate-to-severe pain. Occasionally these stronger drugs may cause side effects such as drowsiness and constipation. Your doctor can advise you about strategies to manage these. Addiction to pain killers is very rare in women with cancer, and all doses are tailored to the individual. Doses can be reduced over time, or eventually stopped when used in conjunction with other types of analgesia. Doses can also sometimes be reduced after radiotherapy is given, which may reduce the pain or stop the pain. support programs run by trained counsellors and psychologists. Although it is recommended that women with bone metastasis avoid heavy contact or high impact sports, you can still enjoy a variety of low impact sports such as swimming, yoga, or walking. This treatment destroys cancer cells in the bone with the use of very strong X-rays. You may have already received this type of radiation to your breast or chest- wall after your initial diagnosis. It is the most effective treatment for bone pain and can also help treat and prevent fractures and spinal cord compression. Normally small amounts (or doses) of radiation are given on one day or over a number of days. This may vary depending on your symptoms, the location and extent of the cancer and if you have had any radiotherapy before. The specialist in this treatment is a radiation oncologist. You will be given individual advice on how much radiation you may need and over what period of time. Studies show that short courses of treatment are often as effective as longer ones. Your doctor may recommend surgery to prevent the weakened bones from fracturing or to stabilise a bone that has already broken. This involves reinforcing the bone with metal supports such as pins and thin rods. This type of surgery is performed by an orthopaedic surgeon. Below is a brief overview of systemic (whole body) therapies. More detailed information about systemic therapies can be found in Westmead BCI fact sheets Chemotherapy for Breast Cancer and Hormone (Endocrine) Therapy for Early Breast Cancer. Bisphosphonates and denosumab are drugs that help strengthen your bones and help prevent fractures by stopping the loss of bone mass. These can taken by mouth or by injection into a vein or underneath the skin. A rare side effect of these drugs is a problem with the bone in the jaw. Good dental hygiene is important in preventing this. A dental check is recommended before you start this medication. These treatments help to slow the growth or reduce the size of cancerous deposits in the bones. They work by blocking the production or the effect of hormones that would otherwise help cancer cells to grow. They only work if your cancer was oestrogen receptor (ER) positive. There are a number of different hormone-blocking medications. Tamoxifen is suitable for most women regardless of whether or not they have gone through menopause. Another option is a tablet called an aromatase inhibitor. This medication only works after menopause. Other options to reduce hormone levels include blocking the function of the ovaries by medicine, radiotherapy or surgery. These are only helpful in controlling cancer in women who have not yet gone through menopause. Your doctor will talk to you about whether hormone- blocking treatments are suitable for you. Chemotherapy is the use of medicines (drugs) to kill cancer cells. These can be given by mouth or by injection into the vein. A medical oncologist is a cancer specialist who can advise you on what type and schedule of chemotherapy drugs may work for you. How effective are treatments for bone metastases? Although current treatments for bone metastases are unable to completely remove all cancer cells, many women with bone metastases can live for many years with extremely good quality of life. The effect of bone metastasis on your prognosis is individual and depends on what type of cancer you have, where it has spread to and how you respond to various treatments. The main aim of any treatment is to control pain and other symptoms so you can enjoy your day-to- day activities as much as possible.